I’m setting up my new XPS 13 running Pop!_OS and one of the things I always have to do on any new machine is to configure git. git config --global user.name "Aral Balkan"
I sign my work and so should you (it’s about security, not vanity). Either generate GPG keys if you don’t already have a pair or export/import your existing GPG keys. 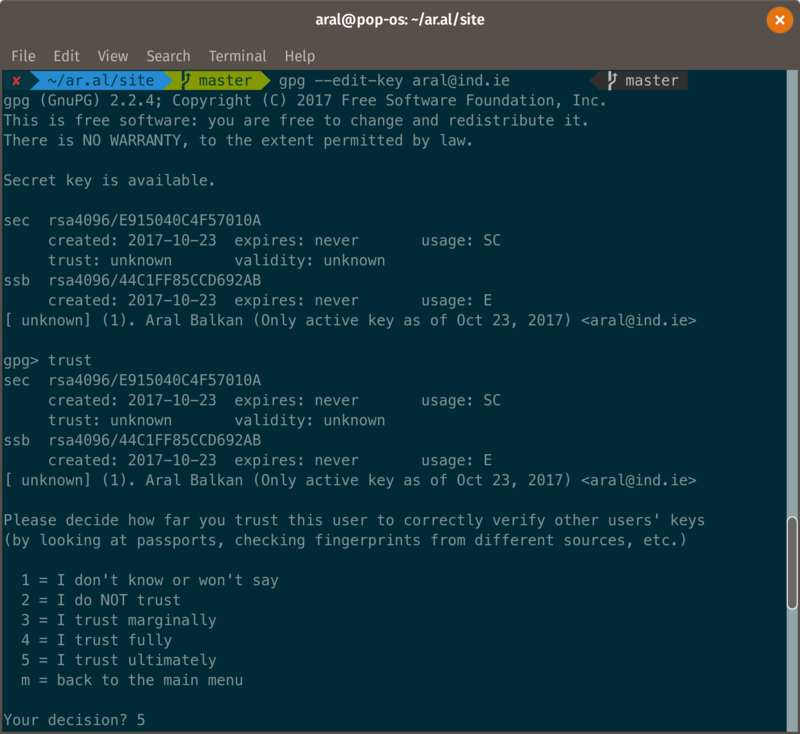 Then, in the gpg shell, use the trust command and select 5 = I trust ultimately. If you don't trust yourself, who are you going to trust? In order to clone and push to git remotes using ssh, you have to create an ssh keypair and then upload it to your git remote (in my case, we use our own GitLab instance running on source.ind.ie). Copy it onto the system clipboard. That’s all I can think off at the moment. If I notice that I’ve left anything off, I’ll update the post accordingly. If you have any initial configuration steps that you cannot live without, please let me know on Mastodon.